It is with great sorrow that I announce the passing of one of my mentors Pandit Chitresh Das. I got the news last night just before bed. I dreamt that I was teaching a large class of children when I got the news. I stopped class to tell them what a great improviser he was, and what an amazing teacher, and how he taught me and so many others new ways of seeing, hearing and feeling. Then I started teaching the students how to pick flowers, in the Kathak mode, in rhythm, as a man, as a woman, and as a wild man. When I woke up, my whole body was full of rhythm. Laying there in bed, complex rhythmic patterns were coming out of me, from me, and from beyond. New ones and old ones I hadn't felt in a long time, like emotions spilling over. I started studying with Chitreshji when I was 20. I traveled to India when I was 26 and met up with him there. He was a child prodigy known throughout India but because of political favoritism in the Guru system he felt under appreciated and when modern dancer Murray Louis offered him a chance to come to America and teach he took it. For twenty years he didn't return. He moved to California where he worked intimately with Zakir Hussain and Ali Akbar Khan to innovate new forms of rhythmic mastery. When I was with him in Kolkata (Calcutta) he was mending fences and building new relationships after 20 years, it was intensely emotional and profoundly gratifying. He introduced me to a lot of people but sent me alone to visit his Guru brother Bachan Lal Mishra, who was practically in tears after he saw me dance in his tiny studio in a dilapidated building. He said this was the true martial spirit of the original Kathak, that Chitreshji had kept it alive. The walls of his studio were covered in pictures of boxers, his inspiration. Kathak is an intimate performance the dancer should be close enough to see the audiences expressions, and it is best done on a marble floor to bring out the full range of sounds the feet can make. Kathak, North Indian Classical Dance, has changed a lot with time. A hundred years ago it was an intimate style that took on the qualities of an improvised duel between the drummer (tabla player) and the dancer. My teacher was a consummate improviser. In our first class he channelled the harsh nuns he had known attending Catholic Schools in India, Rambo with a machine gun, and pop star Michael Jackson. All of this within the strict rhythmic structures of Indian Classical music. 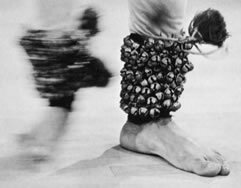 If you’ve never seen Kathak, it is sort of like tap-dance and flamenco done in bare feet and with five pounds of bells wrapped around each ankle. Das explained that Kathak was developed around Rajput warriors and then moved into the Mughal Courts of Lucknow and as the Mughals fell from power many dancers fell into the role of courtesans. With the rise of Indian nationalism, dance played a role as a marker of Indian pride and identity. Chitreshji's father and mother were dancers at the center of this revival and Chitreshji grew up in a home that was a major stopping off point for all the great dancers of Indian, most of them probably performed in his living room. Martial arts were not taught explicitly, and Chitresh Das was not a fighter, but if you’ve ever tried dueling with blades you know that rhythmic footwork with speed and power is a handy thing to have. Kathak also has body technique that can be used as chops, sweeps and elbow strikes, joint locks, and drop steps, lots of drop steps. The bells worn for Kathak are bronze strung tightly together with open facets. From a martial point of view they were armor for the ankles designed to catch blades and weights for developing speed and power. In the historic epic the Mahabharata the thunderous sound of thousands of men stamping their feet with ankle bells struck terror in their enemies hearts. I saw Chitreshji perform countless times, but the improvisations he would bust out in class when we were completely exhausted were always the best. As a teacher he put his entire being into it. In a sense he is always right there with me when I teach, he taught me how to be intensely responsive and aware of every sound and movement my students make; precision and nurturing, compassion and fury. He wanted to give us students a sense of what it was like to study with his Guru, Pandit Ram Narayan Mishra, so we all went up to a YMCA camp on the Gualala river in Northern California for a retreat. During the four days we were there I never saw the river because we were dancing the entire time. We woke before dawn put on our clothes and our bells and started dancing, we ate lamb shank curry for breakfast, which lasted just long enough to eat and take a five minute shower, then we were dancing again until lunch. Lunch was even shorter and we were dancing again, in the late afternoon and evening we did more theatrical movement, singing and reciting in addition to more dancing. Dinners were a blur and with the last shower of the evening came the risk of falling asleep while standing up. In the morning we did it again, for four days. By the end, all that was left of me was a steady vibration, and feet, the bottoms of which looked like raw hamburger. Probably the best performance I ever saw him give was actually a rehersal. We were staying in the flat of a Calcutta painter friend of his, I remember she had a pet monkey who was completely out of control jumping and swinging about the room. When Chitreshji was performing a solo he didn't like to rehearse because Kathak is about spontaneity, but also because it is a symbolic duel between the tabla player and the dancer, and duels are not rehearsed. For about four years I was studying with both Chitreshji and Pandit Swapan Chaudhuri (a great tabla player). When they were scheduled to perform together, both of their students would try to get them to rehearse, with increasing desperation as the event got closer. Each of them would say things like, "Okay, if he needs to rehearse we can rehearse, ask him if he needs to rehearse?" Students were sent back and forth with messages, "Tell him I don't need to rehearse, would it be helpful for him?" Sometimes they would talk on the phone I guess. Anyway we were in Calcutta and Chitreshji was scheduled to perform with what he called a "red hot chilli pepper," that is, a young very fast tabla player, in this case Bickram Ghosh, son of Pandit Shankar Ghosh. So he consented to a rehearsal. It lasted about an hour, I sat at his feet while the two of them went through compositions at top speed, often only doing a half or a third of the composition and then saying something like, "Okay, and so on." This is the thing about Kathak, it is an insider art. To really see, feel and hear it, one has to have a lot of training. When they were stopping a composition a third of the way through I was left hanging on a quarter of a beat. The confidence they had that these complex rhythmic cycles would come out mathematically perfect was itself on show. In recent years, Chitresh Das has had enormous success, the father ten schools in India, America and Canada. His collaborations and innovations are being felt far and wide. This last week I sent off the abstract for a paper I'm going to deliver in England at Cardiff University in June titled, Shaking Thunder Hands: Where Martial and Performing Arts Meet in India and China. It examines evidence that North Indian Classical Dance (Kathak) and Chen style taijiquan share common movement concepts, theatrical representations, and forms of heightened awareness associated with martial enlightenment. I've been working on my book everyday too, and my tabla drums are on the same table with my computer. That's how I've been writing, back and forth between the drum and the key board. So Chitreshji has been on my mind, visiting me everyday. And by some strange coincidence, I made lamb shank curry yesterday! It has been 20 years since I danced with him. Still, his memory, his brilliance and his spirit live on in my work. I am forever grateful to have had him as a mentor. Chitresh Das, demanding more from his students! With love.